MAKE YOU MINE: Findley shows Wesley 'Burgerman' Burger what he's been missing in this scene from Something Fishy. 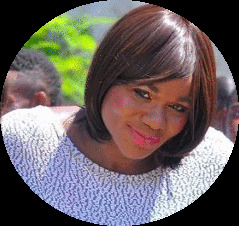 JODIAN Findley’s natural flair for performance and her immense passion for Jamaican culture has made her a rising star. The 28-year-old actress is not a trained thespian. She’s been trusting her instincts and following her light since her primary and high school days, putting together groups for skits and being an active member of her church – writing, co-starring and directing small productions. It was while doing a play for church, circa 2010, that she caught the attention of fledgling playwright Fabian Barracks, who was so impressed by her stage presence that he invited her to audition for his first major play, Family Remedy, which eventually opened to strong reviews that same year, with Findley cast in one of the pivotal roles. Findley, a statuesque young woman at almost six-feet-three, has been moving forward in her stage career ever since, sticking close to Barracks Entertainment. 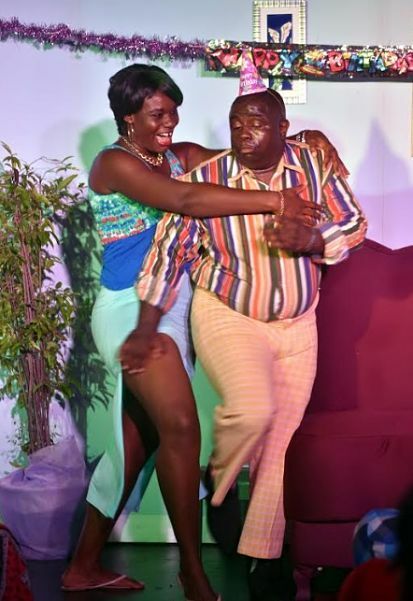 Her penchant for combining great comedic timing with a touch of the dramatic was on full display in shows like 2016’s Barrel Pickney and this year’s Wah Sweet Nanny Goat, but it’s her performance in this season’s Something Fishy that has people talking and drawing comparisons to Andrea ‘Delcita’ Wright. Findley steals scenes opposite her veteran costars Karen Harriott and Angela Jarrett, playing Juliet, a nosy neighbour and close friend who eventually reveals her true colours. To say the least, Findley brings the laughs. When she’s not onstage we miss her. For the Queen’s School graduate, who has a special love for Oliver Samuels, self-expression has always been her thing, so pursuing a stage career at this point in her life is a welcome turn of events. “I love theatre. It’s a real passion. It’s great stress relief. If I am having a bad day, once I get into character I feel so much better. It doesn’t feel like work,” says the Portmore native, who later studied Business Administration at Excelsior Community College. Findley considers herself a shy person, but that persona is a far cry from the comic ferocity she brings to the stage, testament to her innate ability to disappear into a role and convince her audience. Whether she’s dishing about Something Fishy’s relationship-dynamics arc or recalling her coming-of-age days in Waltham Park, volunteering for inner-city community projects, the person revealed is a headstrong Jamaican willing to pour time, effort and energy into doing what she loves most.